This was a GREAT way to end our Apollo unit. We used the longer version and I photocopied a class set and highlighted the different speaking parts for each reader. I had 2 readers for Armstrong, 2 for Aldrin, 1 for Collins, 5 readers for mission control, 2 readers for the narrator, and one reader for Nixon. Crash Landing (pdf) – what do you need to survive on the moon? Great activity for students to really think about what they would need if they were stranded on the moon and had to get back to base. For my 6th graders, I had them rank the cards from 1-12 to see which team made the best choices compared to the expert ranking. Materials: Handout (pdf) and spreadsheet (excel template), and the original lesson (pdf) has the expert rankings and supply cards that you can print out an laminate. Birthday Moons – this is a classic lesson that has I have used over the years. I made a Birthday Moon Phases worksheet (pdf) for my students to use based on the original lesson. 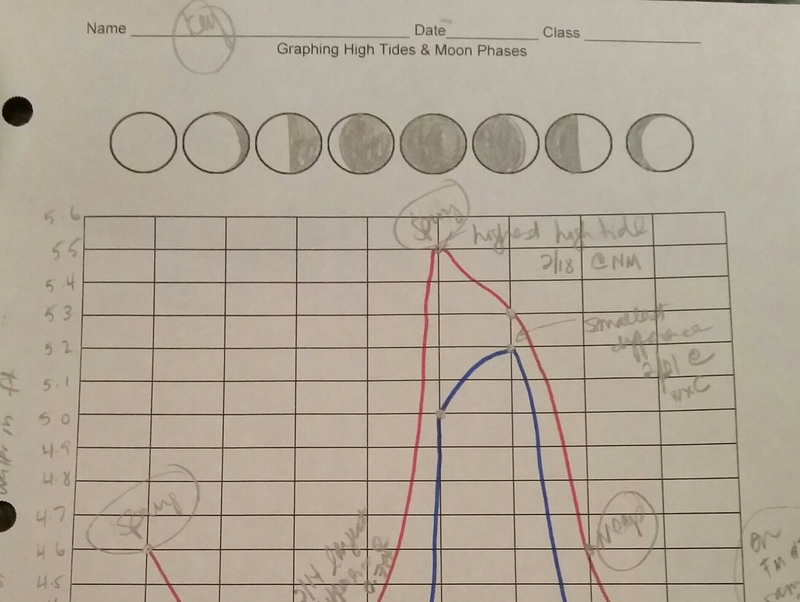 Tides & Moon Phases – students will learn how to read a tide chart and graph tide data to see the relationship between tides and moon phases, worksheet (pdf) for January Tides in Atlantic City, NJ, worksheet for February Tides in Seaside Heights, NJ (pdf) (image link), or a blank template (pdf) for students to choose data from a different location. Is there a shorter version for the “Moon talk”? This a wonderful resource. Varied approaches/ strategies are employed to steer the interest of the students on Astronomy. Definitely, my 8th grade students will learn so much from it.